Many of our laboratory services are ISO 17025:2005 accredited and we are also ISO 17034:2016 certified as a reference material producer. 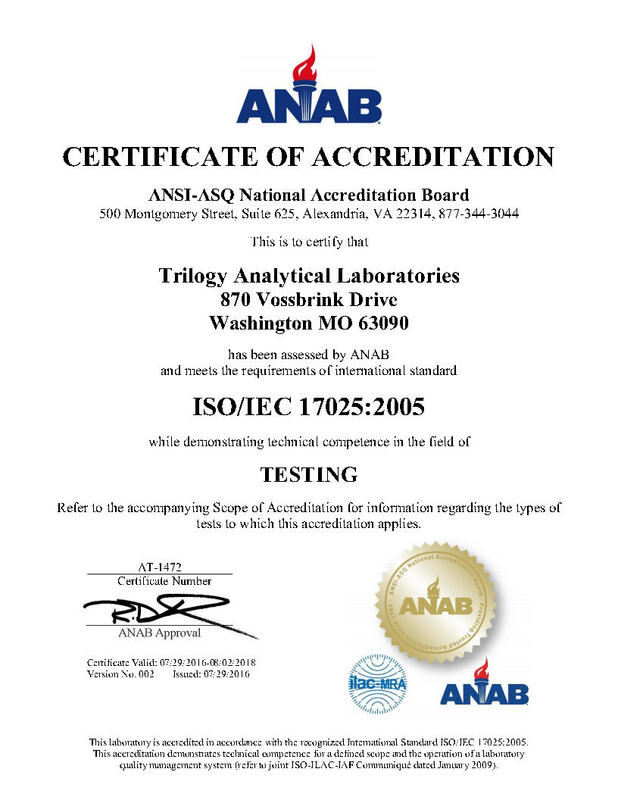 Trilogy Analytical Laboratory is accredited by the ANSI-ASQ National Accreditation Board in accordance with the recognized International Standard ISO/IEC 17025:2005. This accreditation demonstrates technical competence for a defined scope and the operation of a laboratory quality management system (refer to joint ISO-ILAC-IAF Communiqué dated January 2009). Please see our certificate and scope for a full listing of accredited services or contact us for more information.